The neighborhood just got a little bit cooler, thanks to this joint venture. Whitney and Wolfgang Schaefer have been married for two years, and from the day they met, they talked about owning their own shops: she wanted a design shop, and he, a breakfast tavern. “The more we talked about it, the more our separate ideas took on an even more cohesive and unified vision,” says Wolfgang. So after much debate, they realized life is too short and they left steady jobs at the Milwaukee Art Museum and Anodyne Coffee to follow their dreams. Wolfgang and Whitney Schaefer inside Orange and Blue Co. Courtesy of Mann Frau. They scoured the city for a over a year looking for commercial spaces. And it felt almost too good to be true when they happened upon the building they wanted with two distinct spaces, along with a living space upstairs in the neighborhood they coveted. 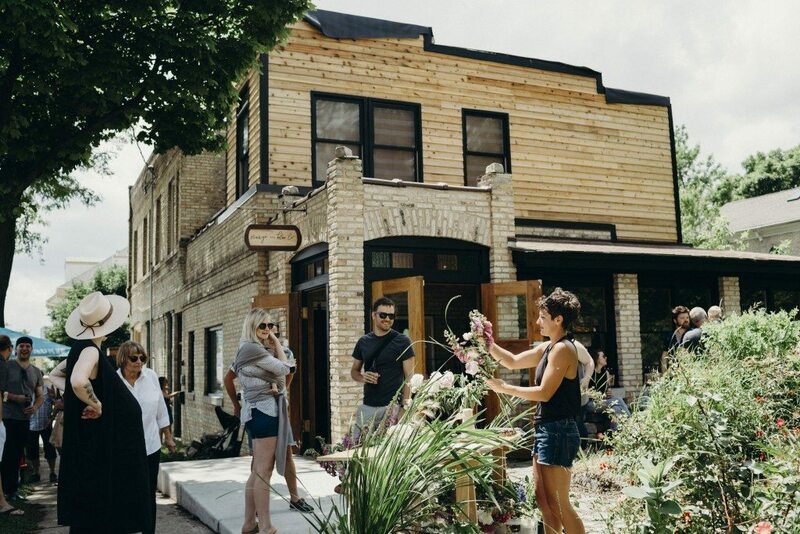 The Schaefers moved from Riverwest to Brewer’s Hill and are thrilled to see the neighborhood continuing to develop, set in motion by stronghold Wolf Peach restaurant. Orange and Blue Co. shop interior. Courtesy of Mann Frau. After about a year and half of planning, rehabbing and stocking, Orange and Blue Co. (1809 N. Hubbard St.) opened in June. The lifestyle shop boasts a curated mix of vintage and modern goods and accessories. The ever-changing mix of pieces is meant to inspire others on how to live comfortably and make old things new. The shop also features local designers Directive, Tactile Craftworks, Fern and Nettle, and more. Whitney travels around the country and region to estate sales to select classic items that embody warmth and quality. Items like candles, Turkish pillow covers, wooden bowls, wicker furniture and ceramics are all popular with the steady stream of local foot traffic they’ve been enjoying. The adjacent Uncle Wolfie’s Breakfast Tavern (Wolfgang’s vision) at the corner of Hubbard and Vine will open in spring/summer 2018. The restaurant will focus on breakfast and lunch only, with an emphasis on good coffee (Anodyne, of course) and simple, seasonal items that appeal to the whimsy of the chef. The Schaefers also have a toddler in tow. They compare operating businesses to parenting – nurturing both projects together all for the greater good for their family and community. Orange and Blue Co. exterior. Courtesy of Mann Frau.